Alexander Gerst was born in Künzelsau, Germany, on 3 May 1976. His favourite sports are fencing, swimming and running. He especially enjoys outdoor activities such as skydiving, snowboarding, hiking, mountaineering, climbing and scuba diving. Alexander graduated from the Technical High School in Öhringen, Germany, in 1995. In 2010 Alex graduated with a Doctorate in Natural Sciences at the Institute of Geophysics of the University of Hamburg, Germany. His dissertation was on geophysics and volcanic eruption dynamics. During school, Alex volunteered as a boy scout leader, fire-fighter and water rescue lifeguard. As a student, from 1998 to 2003 he participated in various international scientific collaborations and field experiments. Several of these expeditions led him to remote locations such as Antarctica where he installed scientific instruments. From 2001 to 2003, researching his master’s thesis on a volcano in New Zealand, Alex developed new volcano monitoring techniques that might improve forecasts of volcanic eruptions. The results were published in Science Magazine. Alexander worked on developing scientific instruments at the Institute of Geophysics at the University of Hamburg between 2004 and 2009. From 2005 to 2009, whilst at the Institute of Geophysics, he also worked towards his doctorate, investigating volcanic eruption dynamics on active volcanoes. His research goal was to determine the mechanics and the energy released during the first seconds of a volcanic eruption. His research led him to visit volcanoes on all continents, concentrating on an active volcano in Antarctica. In 2007 Alexander received the Bernd Rendel award for outstanding research from the DFG German Research Foundation. Alexander was selected as an ESA astronaut in May 2009. He joined ESA in September 2009 and completed Astronaut Basic Training in November 2010. 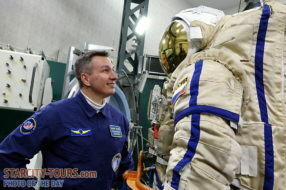 In September 2011, Alexander was assigned to fly to the International Space Station on a six-month mission serving as a flight engineer on Expeditions 40 and 41. In May 2017 Alexander’s second mission, Horizons, was announced including his assignment as International Space Station commander. Alexander is the first of ESA’s class of 2009 astronauts who will be sent into space for a second time, launching on Soyuz MS-09 together with NASA astronaut Serena Auñón-Chancellor and Russian spacecraft commander Sergei Prokopyev in the Summer of 2018. Expedition 40/41 (May, 28 — November, 10, 2014). Alexander was launched on a Soyuz spacecraft from Baikonur Cosmodrome in Kazakhstan in May 2014 and returned to Earth in November 2014. His comprehensive research programme included a wide variety of European and international science experiments as part of his six-month Blue Dot mission. The spaceflight duraion was 165 days.